A month or so ago, out of the blue, I got an email from Jodi Bart asking if I wanted to partner up with Houndstooth to host a coffee cupping for Austin Food Blogger Alliance members. It was difficult to respond with appropriate decorum. Did I want to take Cindy Crawford to my middle school prom? HELL YES I WANT TO PARTNER UP WITH HOUNDSTOOTH FOR A CUPPING EVENT. So I did. And it was unreasonably, awesomely, fantastically, fun. Sunday night at 6:00, about 20 of us filtered in and took seats around the shop, scanning the room, trying to connect actual faces to twitter profile pics and profile pics to blogs. 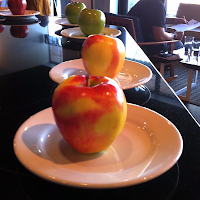 On the counter, there were apples; as Sean's brother Paul ground coffee for the cupping, we tasted them. At first, they tasted like... apples. And when we tried to describe the tastes to each other, a lot of us found ourselves coming up blank, going back for second tries. Soon, we started to isolate textures, and sweetness, and citrus flavors, and the bitterness of peel. And then we were ready. The first step in the cupping is fragrance. This is the part where you stick your nose into a juice glass with a couple of tablespoons of fresh ground coffee at the bottom and inhale. It was a little embarrassing to be in public with one's nose quite so deep in a glass, but it was all so intoxicating that I stopped caring by the time I got to the Burundi. There were blueberry and cherry scents, notes of balsa wood, pepper, chili, almonds. And the fragrance shifted, as the coffee sat, even over a few minutes. We compared notes, and then shifted from fragrance, when the beans were dry, to the more difficult task of aroma, which is what a coffee smells like when it's wet. It's much harder to get a sense for the aromas here, so there's a whole process of "breaking the crust" when going in for the aroma notes, involving a back and forth and book swish of a spoon after the hot water was poured over the grounds. Sean sort of nailed it on this one when he said mostly it'll just smell hot. At this point, we were all revved up and ready to get tasting, and Sean gave us a good demo there too. To taste, you slurp. Full on, snooty wine style, slurp. It makes a floppy wet sound sound, kind of like an air zerbert. I no longer felt like the fragrance was the embarrassing part of the event. But the reward for the slurp was the tastes that came flooding in from these coffees. 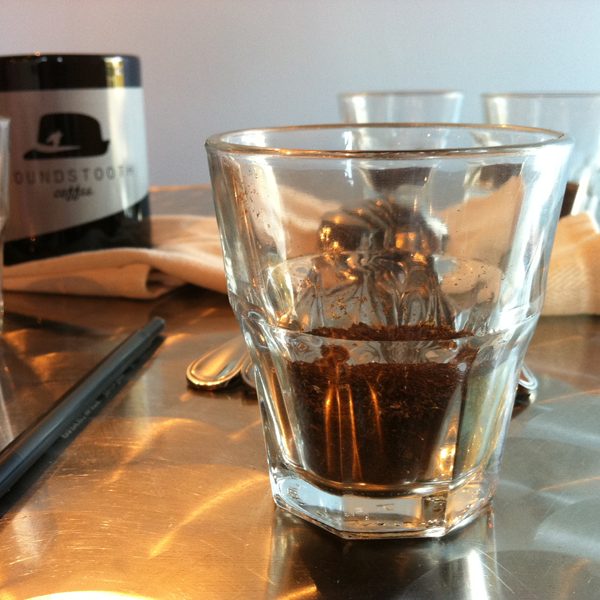 The Mad Cap Gishamwana Rwanda started with flash of sharp almost lemon flavor and the sunk into a silky resonating chocolate. The Gatare Burundi, from Handsome in LA, had a smoother flavor, woody and full bodied, without more subtle changes from start to middle to end. We got almonds from the Finca Nueva Armenia Guatemala, butter from the El Gavilan Ecuador, and a big fat blueberry pie from the Peru all from Counter Culture. Standing around each coffee in little clusters, we'd slurp and compare notes - someone said wood, and someone else said wet wood, and someone else connected that with popsicle stick, and as subjective as this process is, a description resonated, and we could all taste it. Popular vote was a close run between the Burundi and the Rawanda, but the Rawanda eeked out the victory (sorry Maggie), and Paul set about brewing us all cups of it using a few of the shop's Clevers. We sipped, and sighed, and caught up with each other a bit before packing up our cameras and note pads and heading back out into the warm night and home. We are novices - most of us anyway - and we have a lot more to learn. 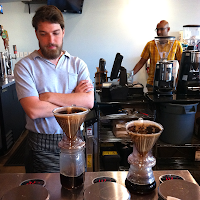 We focused on 3 of the dimensions in a real cupping - fragrance, aroma, and flavor. There's acidity to consider next time, and body, aftertaste, and balance. And the entire SCAA flavor wheel to master. So thank you once again Sean and Houndstooth for having us, and Jodi, who I think is now officially my coffee addiction enabler. Can't wait until next time. Hey, how cool of you to include my story. Now I'm going to go edit mine to include your's and Mike's. I love the three different perspectives of the event. We rock! lol. Major kudos to you for arranging this event, and thanks to Sean for his gracious hosting.